Butler has made an appearance in the first-ever official national Women’s Mid-Major Top 25 poll at CollegeInsider.com, an online basketball fan magazine. The Bulldogs are ranked at No. 22 in the nation as the only Indiana mid-major receiving votes in the poll. The Bulldogs return a strong core of players, including five that started 15 games or more from last season’s 23-10 overall team (14-4 in Horizon League play behind Green Bay, ranked No. 2 in the poll). Preseason All-Horizon League Second Team member and senior starter Brittany Bowen (Columbus North, right) is the leading returning scorer for the Bulldogs. As a junior, the 5’10 guard/forward averaged 11.2 points and 4.3 rebounds per game while shooting .419 percent from the field. 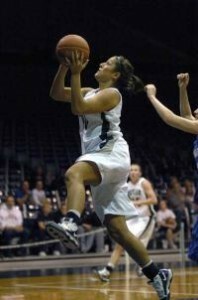 During the 2009-10 season, she was ranked third in the Horizon League in 3-point percentage (.392) and fifth in free throw percentage (.817). Junior Devin Brierly (Southwestern Hanover) started 22 games last season and contributed with 4.0 points and 1.6 rebounds in just under 20 minutes per game, while sophomore Claire Freeman (Heritage Christian) started 15 games and offered up 3.3 points and 1.1 rebounds per contest. Senior Alyssa Pittman (Elkhart Memorial) came off the bench to contribute with 8.8 points and 2.0 rebounds per game. Also returning for the Bulldogs are out-of-state starters Terra Burns (6.6 ppg, 3.5 rpg, 4.2 apg) and Chloe Hamilton (7.4 ppg, 4.1 rpg). The Bulldogs should receive significant contributions from 6’2 freshman forward Sarah Hamm (Winchester), long range sharp-shooting 5’8 freshman guard Mandy McDivitt (Connersville) and 6’2 redshirt freshman Dragana Grbic (Terre Haute South), who all played well in a recent public scrimmage at Hinkle Fieldhouse. Over a decade after creating the Mid-Major Top 25 for division I men’s basketball, CollegeInsider.com has established the women’s Mid-Major Top 25. The well-respected online magazine established the men’s Mid-Major Top 25 in 1999 for the purpose of recognizing smaller schools throughout the regular season. Now entering its’ twelfth season, the men’s Mid-Major Top 25 has become the standard for programs outside of the conventional power conferences. It follows that the Mid-Major Top 25 for Division I women’s basketball will do the same for women’s basketball. Mid-major conferences? Doesn’t that by nature indicate there are low-majors as well? This looks like every league that’s not a BCS conference got lumped together. Get rid of some those! The Big West, Horizon, MAC, MVC, Summitt, Sun Belt, and West Coast all fit the bill. Atlantic 10 should be in there as well, although by their exclusion I guess that means this website figures them for a high major (a stretch). Those eight leagues are definitely on a higher plane overall than the rest they’re lumped in with. As for the list itself, I’d definitely do some tinkering. Even with Thornton graduated, I think Butler’s a little low. They’d run circles around Western Kentucky, for one. Florida Gulf Coast should be higher, Smesko does an amazing job down there. Deleware should be much improved this year as well and has a potential 1st team All-American…players of that caliber at the mid-major level tend to dramatically elevate their teams. MTSU will always be solid under Insell but with their stud gone I think it’ll take a couple of months to find their new identity.